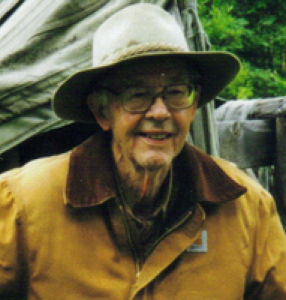 Vernon Anthony Luthman, 87, Willow, Alaska, formerly of Sidney, died at the Creekside Nursing Home in Palmer, Alaska on Thursday, September 6, 2007 at 4:30 AM. He was born August 14, 1920 in Sidney, Ohio the son of Bernard and Amelia (Raterman) Luthman. He moved to Alaska in 1948. Surviving are two brothers, Si and wife Margaret Luthman of Anna, Ohio; Melvin and wife Agnes Luthman of Botkins, Ohio; one sister, Rosalie Hempfling and husband Ralph of Findlay, Ohio and one sister-in-law, Pat Luthman of Sidney; caretaker, Mike Uher of Trapper Creek, Alaska. Three brothers, Vincent, Orville and Merlin Luthman are deceased and a sister, Gloria, is deceased. He was in the United States Army and a member of the Normandy Invasion. He was a member of the National Rifle Association. Luthman took jobs with construction crews hired by oil companies to build an offshore oil terminal and lay hundreds of miles of pipeline. He eventually retired from Valdez Oil Co. after many years. In his spare time, Luthman hiked throught the wilderness communing with nature and looking for an ideal homestead. He eventually found it a year before Alaska gained statehood. Located 100 miles north of Anchorage, the 160-acre property was situated on a lake with a breath-taking view of the Calceelna Mountains. He filed a claim at the land office in Anchorage and agreed to meet the following stipulatons in a five-year period - establish permanent residency there, clear a percentage of the land and plant a crop. He became the first homesteader in what locals call the &quot;Sunshine Area.&quot; A path designated as Luthman Trail by the Alaska Trail Committee was created by Luthman after spending years clearing the path leading to a scenic waterfall by hand. Luthman was known as a pioneer in the Alaskan wilderness. Luthman was a member of Holy Angels Catholic Church in Sidney and a Mass of Christian Burial will be held on Tuesday, September 11, 2007 at 10:30 AM at Holy Angels Catholic Church with Rev. Patrick McMullen. Burial will be at Graceland Cemetery with full military honors. Friends may call at Salm-McGill and Tangeman Funeral Home on Monday, September 10, 2007 from 4-8 PM. Memorial contributions may be made to the charity of one&#39;s choice.